The wing shape that lifters strive for comes when the latissimus dorsi, which is a fan-shaped muscle in the back, is thoroughly developed. The latissimus dorsi, or lats, is responsible for shoulder adduction and extension, which means that it pulls your upper arms in toward your body and back behind you. To create the wing shape, participate in a weight-training program for the back that's designed to increase muscle size. The workouts will overload your lats, which will in turn stimulate growth and increase muscle definition. Schedule two back weight-training workouts every week. Give your lats two to three days off in between each workout so that they have adequate time to heal. A Tuesday and Friday schedule, for example, would be appropriate. Select three lat exercises for each workout, including pullups, lat pull-down and barbell pullover, and complete three to five sets of eight to 20 repetitions. To facilitate muscle-building, keep rest periods between sets short. Helen M. Binkley, in an article published by the National Strength and Conditioning Association, recommends waiting 30 to 90 seconds in between each set. Begin your workout with wide-grip pull-ups. Performing pull-ups with wide hand placement puts emphasis on the lats. Reach up and grip the overhead bar with your hands set a few inches wider than your shoulders and your palms facing away from you. 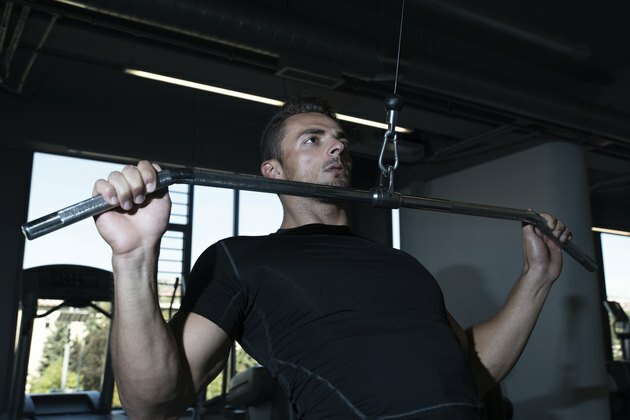 Pull your body up toward the bar until your chin is over the bar and then control your body as you lower it. Perform lat pull-downs with a wide grip. Sit at a lat pull-down cable pulley unit and reach up and grip the overhead bar with your hands set out wider than your shoulders and your palms facing away from you. Pull the bar down toward your upper chest by driving your elbows down to the sides of your torso. Control the bar as you allow it to return to the starting position by extending your arms. Finish your workout with barbell pullovers. Lie on a flat bench by holding a barbell over your chest with your arms extended and your hands set to shoulder-width apart. Keeping your elbows primarily straight, lower the barbell back behind your head until your upper arms are parallel to the floor, and then lift the bar back over your chest. In order for the workout to increase the size of your lats, perform each exercise with an appropriate amount of weight. During lat pull-downs and barbell pullovers, use a weight that causes your lats to become fatigued within eight to 20 reps. If you're unable to do at least eight pull-ups, use an assisted pull-up machine. If you have the strength to do more than 20, wear a dip belt with a weighted plate attached to increase the load.